Mayor Eric Garcetti. MyNewsLA.com photo by John Schreiber. Los Angeles Mayor Eric Garcetti has ended speculation he will be a candidate for California governor in 2018. But, Garcetti found himself sidestepping questions again Monday on whether he intends to run for president. When Garcetti made his regular radio appearance on the “Ask the Mayor” segment on KNX 1070 late Monday morning, he was asked if he would confirm if he’s considering a run for the presidency or would respond to a report from TMZ.com that cited multiple sources saying he is exploring a run. Garcetti, 46 — sworn in as Los Angeles mayor July 1, 2013 — is one of the youngest big-city mayors in the nation, but he can’t run for a third term under city term limits. Garcetti beat Wendy Greuel, then City Controller, with a 54 pehasrcent vote in the 2013 election. He coasted to re-election with about 82 percent of the vote in March, against 10 mostly unknown candidates. Lt. Gov. Gavin Newsom was favored by 26 percent of the voters in California’s gubernatorial race in a recent UC Berkeley poll. Newsom, sworn into the job six years ago, has long been campaigning to replace termed-out Gov. Jerry Brown. Despite not being an announced gubernatorial candidate, Garcetti mustered 10 percent support in the UC Berkeley poll, conducted Aug. 27-Sept.5. “We’re confident the mayor would be a highly competitive candidate in this race, if he ran,” Garcetti adviser Yusef Robb said. Newsom had more than $15.7 million in his campaign chest as of mid-summer. Robb told City News Service Garcetti had not formed a fundraising committee for a governor’s race. Other candidates, including Democratic state Treasurer John Chiang and Republicans John Cox and Travis Allen, also were running far behind Newsom, both in the polls and in the fundraising reports. In the next primary race, the top two finishers will advance to the general election, regardless of party, unless one wins the race outright with a 50 percent plus one vote. Newsom is a former San Francisco mayor. His victory would mark the third consecutive gubernatorial term to be held by a Bay Area resident, as Brown is a former Oakland mayor. The last governor from Southern California was Arnold Schwarzenegger of Pacific Palisades, who left office in 2011. 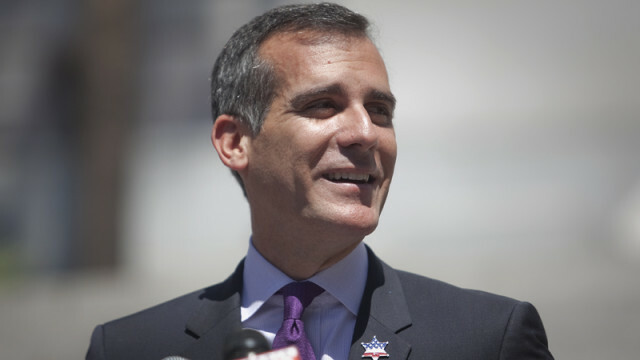 Some political observers say Garcetti is gearing up for a presidential bid in 2020, noting he has made trips to New Hampshire and other key primary states.